Do you know the muffin man? Probably not this one, the one that bakes protein rich bacony-cheesy-mini-meatloaves. So, now that we know the muffin-maker is likely going to be you, let’s get started. After you dig out your long-forgotten muffin tin, it is up to you to procure the list of ingredients: ground beef and bacon being essential. Then there is a single egg, some cheese, dried spices and last, but not least, you will not want to forget the homemade ketchup – the unsweetened version that is chock full of spices and aromatic flavor. The process of creating these mini cheeseburger meatloaves is super simple. Instead of using a paper liner that you cannot eat, you will take those delicious bacon slices and line each section of the muffin pan. Now that’s something to chew on, zero-waste too! Inside of the bacon liner, you will carefully place the cheeseburger mix, which is naturally low-carb and bake them for half an hour, until browned to perfection. Little mess, no fuss, and you can eat them for breakfast or lunch, even saving a few as a snack for later. 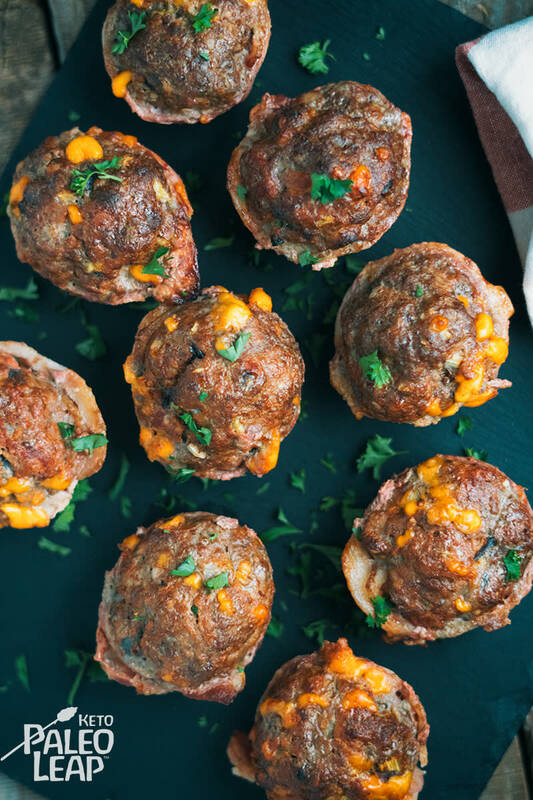 You don’t have to stick with ground beef for your base protein as these mini-meatloaves are versatile in the ingredient department. Pork, chicken, turkey, lamb – it all will do, you can even “hide” some organ meats in there too, along with a handful of spinach leaves for an extra dose of vitamins A and C.
Combine the ground beef, onion, garlic, egg, cheese, ketchup, oregano, and season to taste. Mix everything until well combined. Take a muffin pan and place a slice of bacon around the sides of each hole. Fill each bacon surrounded hole with the beef mixture, and shape into small muffins. Place in the oven and bake 30 to 35 minutes. Let cool about 5 minutes before removing from pan, serve topped with fresh parsley.